Brazilian grindcore mavens Desalmado present a rapid-fire, 15-track, 31-minute eponymous offering where incessant needs for speed and brazen bursts of brutality combine for a headbanging good time. Produced by former Sepultura skinsman Jean Dolabella, this affair features expedient riffs (“Cannibal Social”), blistering percussion (“Cegueira Santa”), and strained vocal screams aplenty (in their native tongue) developed to satisfy those who enjoy the rush of velocity-induced malevolence with a side order of groove (“Ceifador”) rounding out a undeniably relentless attack. 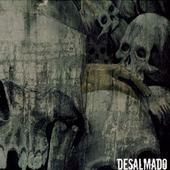 Despite the fact that Desalmado is following the leaders and not guiding the path, they do an admirable job of filling in the blanks and raging out with their own blend of extreme metal madness. For more information, check out http://www.desalmado.com. Revised: 15 Jul 2018 12:47:52 -0400 .